A blog about one man's hobby. 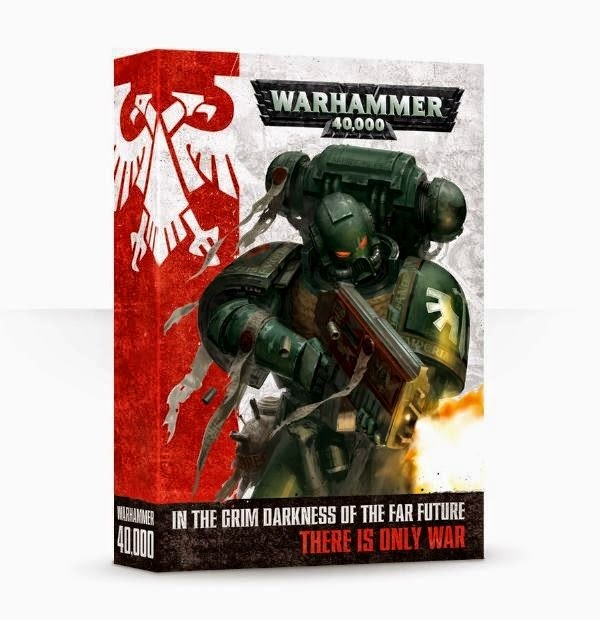 So as you all know I posted a huge rant about the recently released 7th edition, complaining that Games Workshop are destroying all that made the game interesting, fun and unique. But I also withheld absolute judgement until I had seen the book myself in person. Well I haven't bought the book myself (due to being as broke as Knight Commander Pask) but I did get an extensive read of my friend's copy yesterday and I'm glad I reserved judgement, 7th edition now excites me. There are a lot of subtle changes that change the game completely for most players, plus a lot of older rules have been polished (Instant Death, for example now states it takes your model down to 0 rules unless you have Eternal Warrior, solving the problem of "is removed as casualty the same as Instant Death?"). Of all the editions of the game I've read (which is all but Rogue Trader) I had the least amount of questions in regard to how particular rules affect particular circumstances which, for me is incredibly important. That's not to say 7th edition is perfect, far from it. In this review I will avoid all the stuff you already know and focus on the subtle things you probably won't know. Also I will be compiling a list of units that have been nerfed, units that have become awesome and some that are questionable. This will be one of the most extensive reviews I've written and I hope you all enjoy. Psychic Focus - This is a welcome addition to selecting your psychic powers and one that will throw up some tactical options for many players. Now if you select all your powers from a single discipline you gain the primaris power as well, making my all singing, all dancing Tigurius with nothing but Divination a tasty option. This is a massive bonus for Tyranids as it means every Synaptic Creature has Dominion, giving 'nids a new way to counter their synapse problem without sacrificing a better psychic power such as Onslaught or Paroxysm. Perils of the Warp - Although Psychic Tests are no longer passed on Leadership values, most Perils of the Warp results do. This is now a table which you roll on if 2 or more 6's are rolled when generating a power and it's a mixed bag of good and ugly. Results can can vary from instant killing your psychic and the unit he's in to randomly becoming an uber demi-god with rules like Fleshbane and Armourbane for a turn. It's not something you want to roll on though, let me tell you, and you may find more and more Astra Militarum players accompanying their Primaris Psykers with Commissars. Power Changes - A lot of powers have been changed, removed or added. Vortex of Doom is now a Sanctic Power and is a Strength D Vortex weapon, and is replaced on the Telekinesis with the old version of Vortex (Strength 10 AP 1 blast), but this is one of many changes. Powers like Warp Speed and Iron Arm which gave +D3 stats back in 6th now give a straight up +3, Misfortune no longer forces it's victim to reroll failed armour saves but instead gives all weapons shooting at it the Rending special rule (ouch! ), Scriers Gaze now affect Tactical Objectives, Objeration Mechanicum now gives the victim unit's shooting weapons the "Gets Hot" special rule... I could go on. Interestingly enough, however is the complete absence of Puppet Master. A sad loss but I'm sure we'll get over it. Vehicle Damage Chart - Explodes! Now only affect tanks on a result of 7+, so only Open-Topped vehicles and vehicles hit by AP 1/2 are now under threat of one shot kills. Land Raiders and Monoliths just became meaty again! The downside to this however is now every roll on the damage chart does something regardless of the situation. Out of weapons and inflicted with a Weapon Destroyed? You're immobilised now. You're already immobilised? Have another hull point worth of damage. Interestingly Flyers can't be on locked velocity permanently and immobilised either destroys them as per Crash and Burn or merely stuns them for a turn. Even more interestingly, Weapon Destroyed results are now randomised. Ramming - Ramming just got awesome. Now, instead of adding +1 strength for every armour point on the facing in question it now sets the basic strength equal to half the facing's armour value rounding up, then adding modifiers for being a tank and, I believe movement too. So a Land Raider in a ram will always be at least Strength 8 unless their armour is modified for example. Also Dozer Blades now add +1 strength to rams. Vehicles in Assault - Gone are the days where if you remain stationary you are automatically hit in melee. Now vehicles (unless they are Walkers or Chariots) are always Weapon Skill 1 regardless of whether or not they moved and are only automatically hit if they have been Immobilised. Sweet! Also, Chariots are now locked in close combat. Squadrons - Now hits aren't evenly doled out to vehicles in squadrons. Hits are now resolved against the closest tank until it's destroyed then goes to the next tank until that is destroyed etc. Battle Forged Armies - Now Battle Forged Armies can take as many detachments as they want, regardless of points values and can now take several allies. Admittedly this is open to abuse and makes Unbound armies redundant since Battle Forged armies also get Objective Secured and can reroll Warlord Traits without sacrificing much (I saw a list with 6 Dakka Jets, 20 Deathcopters, 3 Weird Boyz and 60 Ork Boyz as a Battle Forged Army, yuck!). Ally Matrix - The Ally Matrix has been revised in interesting ways. Now all armies are battle brothers with themselves (absolutely amazing news for Tyranids) and you can ally with Come the Apocalypse but this option is even worse than Desperate Allies. Also we noticed Tau and Space Marines are no longer Battle Brothers and all Imperial Armies (all lumped under one category here) are Battle Brothers with each other. This doesn't sound like much but opens some interesting new plays, like Grey Knights led by Tigurius, or A Sisters Seraphim Squad led by a Black Templar Captain. Whilst I hate they have ignored some fluff, I'm loving the possibilities. My next thing to do is see if Unbound armies can ally alongside Battle Forged armies so I can have my lone Assassin once again. Warlord Traits - Aren't rubbish in 7th edition. Now Warlord traits affect Battle Brothers, and if no character is available to be Warlord (in Unbound armies for example) one model must be Warlord. The option to have a random Necron Warrior be Warlord is hilarious but pointless. In addition a new chart has been added call Tactical Traits which mostly affect Tactical Objectives and a lot of the older traits have been buffed. Most have lost their prerequisites to use (you don't have to be within range of an objective to use them for example), some have been changed substantially (Night Attacker only makes it Night Fighting in turn 1 and only affects your opponent) and some have been changed completely (Master of Ambush no longer give Acute Senses and instead allows D3 of your units to Infiltrate). Now BRB traits are a viable option which is great news for armies waiting for a new codex. Challenges - Although working more or less exactly the same as 6th edition, overrunning attacks now "spill" onto collateral units, so no more accepting challenges from Sargents to keep your squad intact! Additionally, if collateral units have nothing else to fight they now attack enemies in challenges instead of doling out rerolls. A few people hate this but I think it'll stop the beardy tactics some people utilised to lessen the impact of enemy challenges. Precision Shot - Exactly the same as 6th edition except Characters no longer have this automatically, making Sniper units far more useful. Rending - Slightly nerfed. Exactly as it was in 6th edition but now it doesn't utilise the AP2 against vehicles, only non-vehicles. Still gets +D3 armour penetration on a 6 though. Scout - Scout has become amazing in 7th edition. It reads that you can redeploy units either 6" or 12" from it's original position (depending on type) and can now be used in addition to Infiltrate. Graviton Weapons - Now in the rulebook and exactly as they are in the Space Marine codex. Counter Attack/Split Fire - No longer require a leadership test to perform. Feel No Pain - Is even better now as it cannot be negated by anything other than Destroyer Weapons and Instant Death. Jink - Massively nerfed. Jink is now 4+ but if you decide to use it you can only snap fire. Skyfire - Can no longer fire at ground troops with full BS when combined with Interceptor. Eldrad - Has received an unbelievably good boost in the psychic power department. Sure his level 4 status means he's unlikely to focus and receive a fifth power in the form of a primaris power, but now warp charge is shared, his ability to generate new charges after successfully casting makes him amazingly useful now. Vindicators - Already armed with a Dozer Blade, Vindicators have actually become more effective than Land Raiders at ramming. Once that Demolisher Cannon is gone you can just start throwing it about like a mad man as it maintains a basic ram attack of Strength 9. Ouch! Ironclad Dreadnoughts - Not only benefiting from being harder to kill, Dreadnought Close Combat Weapons are back and are exactly the same except they are no longer Specialist Weapons, so taking a Siege Hammer and Power Fist actually has some use now. Telion - Not so much "buffed" as "not as nerfed as others", Telion carries a sniper weapon meaning he is one of the few characters in 40k to still have Precision Shot. Telion just climbed up in my purchase list. Wyrdvane Psykers - In 6th I always questioned the point of these. Level 1 Brotherhood of Psykers who cost more than a Primaris Psyker really didn't appeal to me. But now Daemonology has made an appearance they make great sacrificial lambs to summon daemons. Wyrdvanes have suddenly become quite cool. Ahriman - Unfortunately Ahriman wasn't quite as blessed as his rival Level 4 Psyker. Now Psykers can fire any amount of Witchfire powers and their bog standard weapons, Ahriman has lost the one thing that made him good. This guy needs some new rules methinks. Deathleaper - Although not bad still, Deathleaper losing Precision Shots is quite a blow to the unique Lictor, plus challenges still leave him vulnerable to the new overkill attack making his Warlord Trait a lot harder to utilise. He is still an annoy snot though. Flying Monstrous Creatures - Now Flying Monstrous Creatures cannot assault the turn they change flight modes, meaning an end to Winged Tyrant/Blood Thirster swoop rushes. Still, I said from the moment 6th edition was released that this was overpowered anyways so think of this as "balanced". Eldar/Tau Vehicles - A small victory for us non Tauder players, Eldar and Tau can't keep jinking every damn shot we make at them without sacrificing their shooting ability, very annoying for people fielding Fire Prisms. Still, with all the overpowered rants everyone has had concerning these two armies, I think it was time they were knocked down a peg anyways. Vanguard Veterans - There's a small clause with these guys and, depending on the inevitable FAQ that will surely come out it could make them not quite as good or absolutely amazing. Disordered charges do not grant +1 attacks full stop anymore so do Vanguard Veterans still get this due to their Heroic Intervention? Knight Commander Pask - Nah, I'm only joking, this guy is still broken as all hell. Interestingly though because of the lack of Precision Shot and Rending no longer being AP2 against vehicles means he has lost some of the impact he had in 6th edition. Still, take him in a Leman Russ Squadron and chances are you can't kill him until you've killed 2 other Leman Russes. Harsh! Well I have to say I've really changed my tune on 7th edition. Yes I still think it was too early to release a new edition, yes I don't want to fork out another £50 just yet and yes the rules for Unbound armies will be abused. Having said that 7th edition seems to play on the principle of High Risk, Big Reward and I kinda like it. Supremely powerful strategies can be played but can backfire massively which kind of balances it all out. Unbound armies are strangely equally viable to Battle Forged armies, in fact actually less tempting in most situations. I still need to see if I can ally Unbound detachments with Battle Forged detachments because this could potentially lead to some awesome set ups (Battle Forged Space Marines with a singular, Unbound Vindicare Assassin, or Battle Forged Chaos Space Marines with Unbound Wyrdvane Psykers converted as ritual cultists for example). Yeah I know how dirty Malefic Powers are, I've had two reports of Daemons winning all the time because of it and we're on day 2! One report said they summoned 60 daemons by turn 2! This is why I plan to recruit some Grey Knights into my ranks who happen to be Battle Brothers now. Ahhh bliss. It Came From The Warp!